Washrooms: Develop a stringent sanitation schedule for washrooms and consider installing automatic cleaners. Garbage rooms: Be sure to keep tight-fitting lids on all trash cans and hose down garbage and compactor rooms regularly. Break rooms: Take out the trash daily and make sure food items aren’t left to rot in employee lockers. Flies: Flies feed on rotting meat, trash and sewage – and then regurgitate on the surfaces where they land, spreading contaminants and disease. Rodents: A single mouse can produce 49 droppings per day, meaning they are constant contaminators. Cockroaches: Cockroaches will eat almost anything, including garbage and decaying material, but they can survive a month without food, giving them plenty of time to sniff out their next meal. Ants: When ants sniff out a food source, they leave a chemical scent trail for others to follow, so a marching ant army won’t be far behind. But don’t worry – Orkin Canada’s suite of odour control products can help remediate your problem at the source! 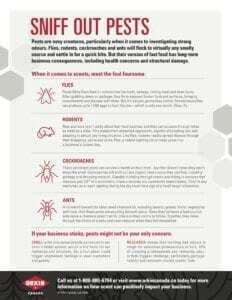 For more about the pests sniffing out your workplace, download this quick reference guide. As spring approaches, pest control leader Orkin Canada reminds homeowners and business owners to take precautions to help keep rodents out. Cities are ranked by the number of rodent (rat & mice) treatments the company performed from January 1, 2018 through December 31, 2018. Out of all pests, rats just might be the sneakiest. They have an uncanny ability to pop-up seemingly out of nowhere, much to the surprise and horror of all who encounter them. Just how do they pull off this magic act? Like tiny contortionists, rats are able to fit their bodies through impossibly small openings. Pest control leader Orkin Canada reminds home owners and business owners to take precautions to help keep rodents out. Cities are ranked by the number of rodent (rat & mice) treatments the company performed from January 1, 2018 through December 31, 2018. This ranking includes both residential and commercial treatments.